uncube's editors are Sophie Lovell (Art Director, Editor-in-Chief), Florian Heilmeyer, Rob Wilson and Elvia Wilk; editorial assistance: Fiona Shipwright; graphic design: Lena Giavanazzi; graphics assistance: Madalena Guerra. As the days shorten and the shadows lengthen, uncube takes a nocturnal turn as we explore the architecture of the night – and beyond. This December issue digs into the fear and the pull of dark places and the light we bring to them: for entertainment, for illumination, for experimentation and for life. From building for the Arctic winter and giant underground neutrino detectors to place-hacking abandoned buildings, illuminated façades and grungy nightclubs…this is our darkest issue yet. The SEQUENCE LED luminaire for offices has been completely redesigned to meet users’ basic needs for personalised lighting, using the current options provided by LED technology to full effect in all aspects. Above the Arctic Circle, where the winters are long and dark, people’s relationship to light changes and thus architecture needs to adapt. uncube’s Rob Wilson spoke to Kjetil Trædal Thorsen from the Norwegian practice Snøhetta about diurnal rhythms in the far north and how his practice’s buildings respond to the lingering blue hour. As a practice based in Norway, with its annual extremes of near-endless days and nights, do you think that at Snøhetta you are particularly concerned with questions of darkness and light? Yes, it is something we have always been interested in. Recently the lighting company Zumtobel asked us to design their annual report, and we used it as a research document, turning it into a project called “Living the Northern Light” to think about architecture in general within the Arctic Circle. We wanted to learn something from doing it that we could put back into our architectural work. Do you identify a particular sensibility that comes from long, dark winters? Well, there are some presumptions about this. For instance, the idea that you get more depressed as it gets darker and closer to winter is spoken of as a basic truth. But new research questions this, and the reason for what is happening might be a combination of things: the cold, the windiness or the wetness, not necessarily just the light. But the lack of light does have some effect? Technically every place on earth experiences the same amount of direct daylight. But interestingly, the horizontality of the sun’s position above the Arctic Circle creates a long blue hour due to reflection of the sun’s light when it is just below the horizon, throwing further indirect daylight onto the earth’s surface the further north or south you get. In effect this means that you could claim, through indirect reflection at least, that north of the Arctic Circle you have more daylight throughout the year than at the Equator. It’s as if the specific daylight conditions are bridging their own deficiency. During the first seven months of life we develop our colour vision, which is influenced by lighting conditions. In a study that Bruno Laeng and others conducted, it was found that people born north of the Arctic Circle develop a stronger tendency, or sensitivity, towards blue and purple. So say you are born there at the end of October, until May it’s almost always dark. This means you never get outside to experience daylight during the time that you are developing your lifetime sensitivity to colour. This raises interesting questions about the influence of artificial indoor light and how such differences might influence our daily decision-making. I like the idea of benign dark spaces in the home – of storage and store-cupboards – it harks back to Gaston Bachelard’s “The Poetics of Space”. Yes, like the cellar that needs to be dark in order to protect the potatoes, an important part of the Norwegian diet, so that they do not start growing. This is a very positive attribution and use of dark space – preventing things that should not happen from happening. But perhaps this also relates back to a particular Nordic sensibility; one reason we’re so structured is that we have to plan for a long winter. The whole preparation and planning sequence needs to be more thorough closer to the poles, where you can’t just eat fruit from trees. Perhaps it influences our organising of everyday life. How do the specific changing conditions of light near the Polar Circle affect the design of architecture? The light conditions change throughout the year. Nearer the Equator you can establish a much easier rhythm, and in designing a house there you have a predictable day and night situation. But when you have slow transitions throughout the year, you have to adapt to the light conditions in a more complex manner – through using a building’s shape, for example. In summer, when there is the midnight sun, you need to shade the lower windows during the day towards the north to avoid glare from the low sun, and open up fully to the south. In the transitions of autumn and spring, you have to be able to open up on every side – including skylights above – so that you get as much light as you can from the sky. And during the winter, when there’s no light anyway, it doesn’t really matter! But then the house itself becomes a marker in the winter, a glow in the dark. Outdoor spaces in Norway were traditionally purposefully lit through the windows of buildings: from inside to outside. Snøhetta have used this idea in our own architecture: for instance, in our opera house in Oslo, where the exterior roof is lit from inside the lobby. It’s similar to what Alvar Aalto when he used skylights. Another quality connected with darkness is danger: the feeling that it’s hostile. Yes, which often connects to the fear of crime. The idea is that crime is always committed in the dark, but that’s just not true – it’s much harder to shoot someone when it’s completely dark! These reverse misunderstandings of danger only occur when you start lighting exterior spaces for security. What happens is that you create enormous insecurity in the border zone of that light, so once you move beyond it, you suffer double anxiety. Contemporary architecture could be seen as a constant battle, using expanses of glazing or electricity to even out the rhythms of natural light. And with artificial light there tends to be this divide between “task lighting” and “general lighting”, but there are contradictions in all such terms. A new difference is now developing between lighting from a source and lighting from a surface. This has developed mainly from carrying your laptop or mobile phone around with you as a light source. One of the first apps to come out was the one converting your mobile into a torch, which represents the individualisation of light, carried close to your body, from one space to another. It’s a bit like it was before electricity was introduced, when you carried a moveable lamp around with you from room to room. So the lit surface is reduced to only that which you need to get information from, and the rest of the space around you can remain dark – reducing energy use too. Of course the development that’s coming is manipulated surfaces replacing source lighting generally: screen surfaces that provide you with all the light that you need, so we may move away from task lighting again and back to just lighting up the space generally, not that part which individuals need at any particular time. Perhaps you will artificially be able to prolong the day too, if you imagine that daylight through a window could be gradually replaced by the growing glow of the OLEDs (organic light-emitting diodes) from a screen. How does your thinking on these issues shape projects at Snøhetta? It’s in smaller projects that issues of light are touched on most clearly; it becomes more obvious if the essentials are boiled down. The Tverrfjellhytta Reindeer Pavilion, for example, has no artificial lighting inside it, and the interior is only lit from one source: the fire. Internally, its curved wooden walls are designed not only in relation to how you sit towards the view, but also to catching the light and warmth coming from the fireplace, maximising it so it penetrates the space. And from the outside at night, the light beams out from the big window that's orientated towards the mountains. Other projects that we’re working on are a series of what we call keyless structures: public access buildings without keys that you can walk into 24 hours a day without surveillance cameras annoying you all the time. 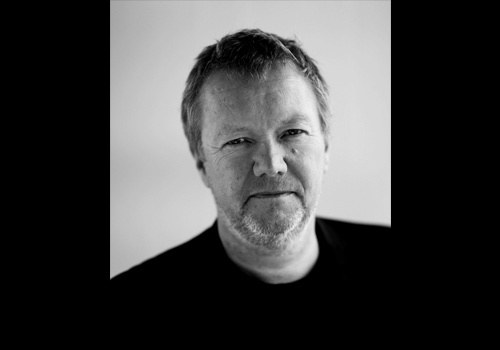 Kjetil Trædal Thorsen (*1958) is an architect and founding partner of Snøhetta, an international architecture, landscape architecture, interior design and brand design office. He was born in Norway, and spent several years in Germany and England, before studying architecture in Graz, Austria. He then worked in the offices of Espen Tharaldsen (Arbeidsgruppen Hus) in Bergen (1982–1983), Ralph Erskine in Stockholm (1983–1984) and David Sandved in Haugesund (1985), before co-founding Snøhetta in 1987. Thorsen has led Snøhetta teams designing the museum for the Winter Olympics in Lillehammer, Norway, the 2007 Serpentine Gallery Pavilion in London designed with Olafur Eliasson, the Bibliotheca Alexandrina library in Alexandria, Egypt, and the Oslo Opera House in Oslo, Norway. He was a founder of Norway’s architecture gallery, Galleri Rom in 1986. Since 2004, Kjetil Trædal Thorsen has been a professor at the Institute for Experimental Studies in Architecture of the University of Innsbruck. Are you seeing these buildings as prototypes for less tailored but bigger solutions for those large chunks of the world still off-grid? The original inhabitants of Coney Island, the Canarsie Native American Indians, named their then-peninsula the “Place Without Shadows” – a seeming premonition of what it was later to become. After severance from the mainland by a canal in 1750, by the late nineteenth century the promontory at the entrance to New York Harbour was completely transformed into a playground for New Yorkers seeking an escape from the city. Deep underneath Japan’s Mount Kamioka in a cavern big enough to contain your standard Gothic cathedral, a 41-metre-high, stainless steel cylinder houses one of modern science’s own cathedrals of sorts. The huge Super-Kamiokande Neutrino Detector was built for the sole purpose of understanding one of the most elusive subatomic particles, the neutrino (best known in lay circles for being accused, but later acquitted in 2011, of breaking Einstein’s universal speed limit). Like the superstructures of the Middle Ages, the walls – equipped with the high tech of our own times – were designed to help us understand the world, but unlike their forebears, not through windows illuminated from without, but by a flash of light caused by the rarest of all events: the interaction of a neutrino with another particle within. Neutrinos are highly unreactive. Everything in the detector is set up to heighten the statistical chance of a fortuitous collision. The location is so far underground that it not only protects the site from all visual light, but also from cosmic rays, ensuring that only neutrinos are the cause of any measured events. The gigantic cylindrical tank is filled with 50,000 tonnes of super-pure water and every single one of those water nuclei has one precise purpose: to wait for one of the billions upon billions of neutrinos, that rush through every cubic metre of the experiment each second, to hit it. If and when this happens (and it has only happened a handful of times since the experiment started in 1996) an array of over 10,000 light-sensitive detectors carpeting the walls, ceiling and floor are waiting to record the instance of a tiny flash of light – so-called Cherenkov radiation – which results from such a collision. Under cover of the night, a group who call themselves “place hackers” are committed to reclaiming liminal and abandoned urban structures in a form of playful exploration with liberationist overtones. Social geographer Bradley Garrett shares his immersive documentation of their spectacular subversive escapades with uncube. All photos and videos: Bradley Garrett. In 2011, there was a mothballed 15-storey construction site above Aldgate East Tube Station, situated on the largely invisible border between the City of London and Whitechapel. It was owned by an Icelandic company that had gone bust in 2008 and had walked away from its investment in the ongoing gentrification of the East End. Three years after the desertion, a construction crane still remained poised above the empty building like an insect feeding on a carcass. Locals fed on it too, smashing up the concrete to rip out re-bar for recycling, a lucrative illicit trade. The building site was, in effect, turning into a ruin, an apt spatial metaphor for the financial crisis. Long after the sun had set over the capital, my friends and I, a loose collective of recreational trespassers, could easily slip from the flow of late-night revellers at the intersection of Commercial Street and Whitechapel High Street, down a dark alley behind the site. Sticking to the shadows, it was possible to climb over the back fence, in plain view of a few old cameras that could not see in the dark, tiptoe through the dank, dripping stairwells of the building using a mobile phone as a torch and emerge onto the incomplete roof to ascend the rusty crane. Looking west from the jib, a herd of glass and metal City skyscrapers could be seen jostling for prominent 24-hour uplighting amidst a forest of newer, more energetic cranes. To the east, Whitechapel was dark and relatively flat. These are the dichotomies of light emanating from the city at night, which are more visible from a height than from the streets in plain sight. Spinning 360 degrees on top of the crane cab, I recalled Charles Dickens’ nocturnal walks to “London over the borders” and was reminded that Aldgate was indeed once an actual gate in the London Wall, a literal boundary. This boundary, though less visible today, is still very much active – as every Shoreditch hipster knows, when you want to have a night on the town in London, you don’t head into the overbearing monumental lumination of Liverpool Street, but into the dark shadows and flickering neons of East London. Then again, we are not hipsters looking for trendy bars; we are nocturnal trespassers scribing in light – those tungsten spotlights spread into handsome stars during long-exposure photos. My friends and I, the ones who clambered up that crane, have trespassed into and photographed over 300 off-limit locations in eight countries since 2008. We are place hackers, information-leakers, finding and sharing our impressions of the hidden city through blogs and books. Though the immediate experience of exploring is powerful on a personal level, it’s the sharing of those experiences that gives place hacking its political edge. Like pub- and club-goers, ecstasy-fuelled ravers, and tin-tipping drifters, we are denizens of the dark. Yet where sociologists have written much about the emerging “night-time economy”, we are not interested in the least in the night as a productive economic space. Like Dickens, we are more preoccupied with the liberty darkness allows – where, as A. Roger Ekirch writes in his 2005 book At Day’s Close: Night in Times Past, we can find ‘‘freedom from both labour and social scrutiny’’. Here an interesting paradox presents itself, because by the very nature of the city’s all-too-predictable central business district banality, with its brightly lit streets and lack of late-night commercial entertainment, opportunities are afforded for other sorts of social freedom after the corporate workday ends. Though a night out in Whitechapel has its own charms, the financial centre of London, ruled by economics, utility, practicality and efficiency, is a post-gloaming ghost town. This is when we run wild, speeding around skyscrapers, blasting pirate radio, parking recklessly, popping manholes, climbing buildings, hanging from cranes, and living out a post-apocalyptic fantasy where any notion of rational decision making processes are ripped down from their abstract pedestals, replaced by a carnal desire to be present in the city. We are, in the words of contemporary geographer Tim Edensor, utilising the night as a space for “transgression, fantasy and experimentation”. The city we desire is thus conjured, regardless of the intentions of planners, architects or security forces, and it doesn’t cost a cent. Like the local re-bar-rippers in the Aldgate construction site, we simply feed on what is already there, no judgment required. And yet the paradoxes compound. What place hackers are performing night after night, in a strange way, is a form of unsolicited labour, a kind of secret city survey. We are at work, photographing the city that most people don’t see, the city most people choose to ignore, “a second city – with its own geography and its own set of citizens”, as writer William Sharpe described it in 2008. We publicise these photos in print and online, at great risk, with purpose – to suggest to Londoners that rather than simply defending “London over the borders” from sprawling gentrification, we can bring our over-the-border desire-ruled temperaments to the city itself every night, re-imagining these cold, stark, unforgiving environments as spaces of play and creativity, as public spaces. Each photo we distribute carries with it a hidden weight of permission taken where it never would have been granted. Often, others also labouring at night, driving street sweepers, patrolling pavements in front of nightclubs and cleaning offices, acknowledge us with a nod and a wink. In the haze of the unsustainable artificial urban glow of the City, empty of pinstripe suits, there’s plenty of room for all sorts of characters. One night in 2014, after climbing the Walkie-Talkie skyscraper with three other place hackers, we were sneaking back through the shadows to the bordering fence to make our escape after a successful mission to the roof when we saw another black-clad character climbing into the site, not with a camera bag and tripod like us, but with a guitar case. Realising he was obviously a fellow trespasser, we got close enough to ask him, in hushed whispers, what he was up to. Bradley L. Garrett is a social geographer at the University of Southampton with a passion for photography of off-limits places. His first book, Explore Everything: Place-Hacking the City (Verso Books, 2013), is an account of his adventures trespassing into ruins, tunnels and skyscrapers in eight different countries. His second book, Subterranean London: Cracking the Capital (Prestel, 2014), is a photographic dissection of what lies underneath the streets of London, layer by layer. Charles Dickens, Household Words: A Weekly Journal, Volume 16, 1857. A Roger Ekirch, At Day’s Close, Orion Books, 2005. Tim Edensor, The Gloomy City: Rethinking the Relationship between Light and Dark, Urban Studies, 2013. William Sharpe, New York Nocturne: The City after Dark in Literature, Painting and Photography, Princeton University Press, 2008. He told us he was “looking for an inspirational place to jam”, and eyed up the roof. After showing him our photos from the top, we wished him luck, shook hands and parted ways. The Swiss photographer Joël Tettamanti is an observer, a watcher who soaks up a place like a sponge for a brief period of time before releasing what he has learned back into his eerily beautiful images. His work takes him to many distant lands but in the end it is always the light that rules him: “Some places have a unique light,” he says, “there are areas of China that are very bright but intensely overcast and in Greenland the light is sometimes so bright it is too complicated for me to shoot”. After nightfall it gets even more difficult. Here he shares his thoughts with uncube alongside a selection of his after dark shots from Iceland, Nigeria, France and Spain. The Swiss photographer Joël Tettamanti was born in 1977 in Efok, Cameroon and grew up in the Jura, Lesotho and Switzerland. He is now based in Lausanne and teaches photography at the ECAL design school there when he is not travelling the world shooting extraordinary landscapes and portraits. His work has been exhibited widely and he has published three monographs: Local Studies, (Etc. Publications, 2007), Davos, (Scheidegger und Spiess, 2009) and, just published, Joel Tettamanti: Works 2001-2019 (Benteli Verlag 2014). Berlin-based artist Carsten Nicolai has spent the last few years concerning himself with scientific reference systems in both his artworks and his music (produced under the pseudonym noto). He uses mathematical patterns, grids and codes, manipulating random, self-generating structures with the precision of a scientist to create poetic and engrossing works that demonstrate well the close ties between technology and spectacle in our digital age. Light and sound are a big part of Nicolai’s oeuvre. As part of the 2014 Art Basel Hong Kong he created a monumental city-scale installation called α (alpha) pulse. Based on the effects of audio-visual stimulation on human perception, it utilised the entire façade of the 490-metre-high International Commerce Centre skyscraper on the Kowloon harbour to send pulses of light throughout the city. An accompanying app that individuals could download on their mobile phones provided a pulse of sound and an additional layer of light patterns to go with it. There are many remarkable things about this 100-metre-long media façade developed by Berlin-based office realities:united for the new Contemporary Art Center in Cordoba, Spain, but two main components turn it into an exceptional work. First, there is the fact that building’s inner structure of polygonal rooms is reflected with the façade’s 1,319 polygonal dishes, cast into concrete panels. Each dish contains a lamp whose intensity can be controlled individually via specifically designed software, thus acting as a pixel in a huge grey-scale, low-resolution screen. This makes it almost impossible to screen the common content of other media façades like text messages and advertisements; the intention is for art institutions to integrate its specific potential into their artistic programmes. Second is the way it answers the question of what a media façade can do during the day. While most are made of glass and LEDs, making them look rather dull in bright daylight, this one features a versatile topography that creates an ever-changing play of light and shadow 24/7. In 2006 Pearce was the principal design architect for an office building for Melbourne City Council in Australia called Council House 2 (or CH2). It utilises an innovative combination of passive measures to maintain a natural ventilation and comfortable indoor climate of 21-23 degrees Celsius in a city where summer temperatures can soar to 45 degrees. A key aspect of this climate system is what takes place in the building at night. “If you want to design a building which works passively by responding completely to its immediate environment then the night is as important as the day”, explains Pearce, adding: “CH2 uses the night to disperse day heat like the planet does through back radiation into space”. The office’s exposed concrete ceiling panels are chilled during the day providing radiant cooling for the building’s occupants and storing excess heat in the ceiling spaces above. Previous page: view of the wind turbines that sit atop the roof of the CH2 building. Then, some 60 percent of this heat is removed at night during the “night purge”, when the windows automatically open to a maximum of 65 degrees and the cooler night air is drawn in, across the undulating ceiling panels, to be then sucked out through shafts at the side of the building, drawn up by the assistance of wind turbines on the roof. This natural ventilation system, usually occurring between 2am and 6am, is based on the way termite mounds regulate their core temperature, using this same chimney or “stack” effect. It is simple in principle but its efficiency is dependent on the CH2’s computerised building automated system BAS, which uses temperature, wind and rain sensors on a floor-by-floor basis to optimise its functions: if the building is cool enough, the windows stay closed. The heat of the daytime air is removed and purged, via windows which open to an angle of 65°, through shafts on the side of the building. Supplementary cooling measures in the building, particularly useful for the retail spaces on the lower floors, include a set of “shower towers” at the side of the building through which air and water fall and cool together. The water is then pumped through a phase changing material (PCM) plant in the basement which also acts as an additional passive cooling unit – like a rechargeable battery – to help keep the ceilings refrigerated, maintaining a steady supply of “coolth” (as against warmth) during the day. CH2 is Melbourne’s flagship building for sustainability. Yet a report by Exergy Australia in 2012 found its performance not quite matching its promise. The architects hoped to generate energy savings of around 88 percent, yet the actual value is closer to 50 percent. Pearce believes this is due to a number of reasons: “The contractors handed over the building after their one year guarantee ran out and the occupiers did not educate anyone to run such a complex building. You need an engineer to run a fully computerised control system being fed with data from 2,500 probes in the building’s structure and equipment. There was soon a data overload and no one to deal with it. Hopefully Melbourne Council will do something about this”. He adds that while users were assumed to tolerate a temperature range from 20-25 degrees Celsius, in practice they refused to budge from 22-23 degrees, whilst admitting too that the co gen plant seems less efficient than predicted. This does not however mean that CH2 is unsuccessful. 50 percent is still a considerably large reduction. “Shower towers” provide supplementary cooling to the building, which lies in Melbourne’s city centre. Mick Pearce (*1938) was born in Southern Rhodesia, present day Zimbabwe, and trained at the Architectural Association in London, and has since worked in the UK, Zambia, Zimbabwe, Australia, China, and South Africa. Over the last 20 years Pearce has focused on sustainable architecture that explores the principles of biomimicry, imitating natural processes and materials, aiming to minimise damage to the environment. One of his best-known buildings is the Eastgate Shopping Centre in Harare, in which the system of temperature control in the building was also inspired by the construction of termite mounds, leading to significant energy savings. Pearce left Zimbabwe in 2000 as a result of the conflict there and worked in Australia, where among other buildings he designed the CH2 in Melbourne. He went on to work for three years in China, before returning to Zimbabwe in 2012. In 2003, Pearce was honoured for his innovations in the field of ecological and sustainable design with a Prince Claus Award from the Netherlands. Don’t we all know that moment when suddenly the lights go on in a club we’ve been stuck in for the last five to fifteen hours – dancing, smoking and drinking in the dark – and all of a sudden the magic is gone and we find ourselves in some stinking cellar with a bunch of pale, tired, sweaty, drunk (or worse) people? Clubs are spaces made for darkness with their sparse, flashing lighting, smoke effects and thundering sound. So when IVAAIU architects were commissioned to design a small new space for techno music, the “Vurt” in Mapo, a city quarter of Seoul, they aimed for an “optimal minimum”. This means that they removed more from the space – a low, dark cellar under an office building – than they’ve added. All partition walls are gone, turning the cellar into a vast open hall with slender, raw concrete columns. To increase the impression of openness they’ve added an even narrower, more claustrophobic space just in front of the entrance door: a dark and minimal tunnel, which leads down from the street and, after a sharp turn, into the club. All photos: Limso. Photos and drawings courtesy of IVAAIU City Planning. An earlier book on your work entitled Composition, Contrast, Complexity, analysed these as three core aspects of how you conceive your architecture. Your upcoming book is called People, Place, Purpose. Does this represent a shift from more architecture-focused to more user-focused concerns? No, that was always in our work, but now perhaps I have more of an awareness of it, particularly after working all over the world. You develop as an architect, you have to, you need so much knowledge, so much skill. You only become a good architect after fifty years or so, because you really need so much experience to draw on. The work I am doing now I could never have done when I was twenty-five, just after finishing school. And the order is People, Place, and then Purpose – because there is too much focus on purpose in certain architects’ work as the generator of a building. I am not like that. I am not purpose-driven in an architectonic view: the purpose of a building might change. But everyone has their own philosophy. Like making music: there is not just one way and we should be happy about that. Our buildings don’t all look the same, but they are all the same – not the form, but the same attitude. What you are taught so often at school is to develop your own style of forms – but for me that’s not interesting. Yet I think when you see every one of our buildings, it is clearly Mecanoo. Inside in particular: I like to make unforgettable interiors. Francine Houben (b. 1955) is the founding partner and creative director of Mecanoo Architecten, which has its main office in Delft in the Netherlands, with satellite offices in Manchester, UK, Washington D.C., USA and Kaohsiung, Taiwan. The practice has worked on a wide range of projects including university buildings, housing, museums, hotels and offices, but is particularly well-known for its work with libraries, such as the Delft University of Technology Library (1998), the current refurbishment of the Martin Luther King Jr. Memorial Library, Washington D.C. and the recently completed Library of Birmingham, which was shortlisted for the 2014 Stirling Prize. Current projects also include the Bruce C. Bolling Municipal Building, Boston, USA (2011-14); Municipal Offices and Train Station, Delft (2006-15); the Wei-Wu-Ying Center for the Performing Arts, Kaohsiung, Taiwan (2007-16). Houben has taught widely, including as visiting professor at Harvard in 2007. She was the curator of the first International Architecture Biennale Rotterdam in 2003 and was recently named the Architects’ Journal 2014 Woman of the Year. You’ve talked about the importance of analysis and intuition in your work, in projects such as your recently completed Birmingham Library. Some people think intuition is something female. It is not. It is more about experience. I have a lot of experience in designing libraries and theatres, but I didn’t know anything about Birmingham. So I could focus totally on Birmingham, because I didn’t have to focus on libraries or theatres. The very first time I went there, I just observed the city. It is a very energetic, chaotic place with all these periods of architecture and urbanism, all these different identities. And I could totally focus on how the building could be positioned in the city, create public space and improve Birmingham. What was the reason for creating such a bold statement with the library, with its series of interlocking rings?